Ms. Bee, why do you buzz? First, mechanics. When the bee flaps its small wings with amazing speed, it creates a gust of wind. Well, actually, it creates a lot of short, strong gusts of wind, so sudden and definite, that we hear it as a buzz. Flies buzz and so do other insects. Second, some bees buzz even when they’re not flying. Bumblebees are known for their characteristically loud buzz. However, unlike hive-dwelling honeybees, bumblebees don’t just buzz when they’re flying. They can, and do, produce that same buzz without moving their wings. And it is just the vibration from this flightless buzz that makes them uniquely valuable pollinators of certain crops. After landing on a blossom, the large bumblebee grabs the blossom and holds it tightly. While maintaining this tight grip, it strongly vibrates while remaining stationary. Nothing less than the bumblebee’s strong vibration will assure pollination by shaking loose sufficient quantities of the thick pollen produced by certain species of plants. No other bee could do this job as consistently or successfully. Bumbles are specially suited to pollinate a variety of cash crops including tomatoes, cranberries, almonds, apples, zucchinis, avocados, and plums. Their unique style of pollination accounts for about 3 billion dollars in produce each year. Third, recent speculation suggests that bees may buzz to enhance their electronic communication. Yes, electronic communication ! Honeybees communicate with each other through a variety of dances. One of the bees’ “steps” is the waggle dance. When a single bee discovers an area rich in pollen and honey, the bee returns to the hive and does the waggle dance. The bee’s dance moves inform the other bees of the location of the blooms that will provide the most food. What does all this have to do with buzzing? Well, guess what makes the dancing bee’s electrical field even stronger? Sound. The sound of buzzing. So, the buzz of the honeybee may not just be the sound of its wings, but an electronic amplifier that works like a loud speaker to broadcast its message louder and farther. Fourth, . . . could the bee’s buzz be a warning? Does the buzz of a swarm of bees scare-off persons or animals that might, otherwise, interfere with the bees’ work or disturb their hive? Frankly, when I started writing, I was planning to list only three reasons why bees buzz. But, then, I imagined the sound of a swarm of bees buzzing. The sound brought a knee-jerk reaction – alarm – and I wanted to get away fast. My urge was more of a reflex than a thought. And, then, I remembered a story about a movie. It was rumored that the sound of a swarm of agitated bees was inserted into the soundtrack of the 1973 horror film, The Exorcist. As the story goes, to keep audience tensions high during relatively quiet scenes, director William Friedkin, inserted the sound of a swarm of agitated bees into the soundtrack. No one actually heard the sounds because no one was supposed to hear them. The recording of the agitated bees was intentionally introduced at a subliminal level of volume. That is, the recording was played at a volume too low to be consciously heard. But the volume was sufficient to allow viewers (and listeners) to unconsciously “hear” the buzzing swarm and react with their own fear and agitation. Whether true or not, the story assumes that the sound of the buzzing of a swarm of angry bees is terrifying to human beings. So, maybe the bees’ buzz has yet another purpose: It keeps meddlers at a distance while the bees do their work. About the creepiest of all the land-roaming creatures is the spider. But it only makes sense that, with 8 legs, the spider would be among the most sure-footed animals on earth. And sure-footedness was just what researchers were looking for in a new search and rescue robot. So, it’s no surprise that they picked the spider as their model. Researchers at the Fraunhofer Institute for Manufacturing Engineering and Automation, in Stuttgart, Germany, have developed a new weapon in the search and rescue arena: a robotic spider. 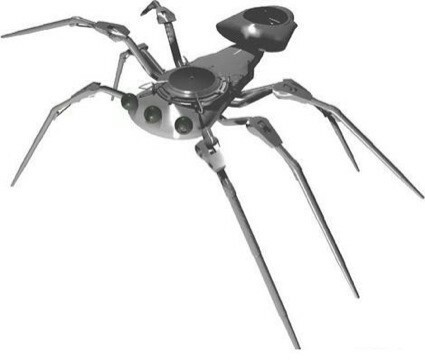 In stark contrast to the real eight-legged arachnid’s creepy reputation, its robotic incarnation is not just your friend, but your potential rescuer. These spiders can, for example, creep into the smallest spaces in collapsed buildings and provide location information about trapped victims as well as damage and air quality assessments. These ‘bots are about as friendly and helpful as real spiders are not. But, personality aside, in terms of the mechanics of operation, these robots are really a lot like the actual spider. Research groups throughout the world have turned to biomimicry in designing the last few generations of robots. That is, the robots of the future are being designed not just to imitate, but to function just like, plain old biological organisms. In old sci-fi movies, robots of the future were visualized as almost anti-human and anti-organic. In other words, they were made to look like everything that plain old living creatures weren’t — sporting sleek metal and glass surfaces with an enormous bulk and weight carried hither and yon on wheels. However, when it came to building the real thing, these sleek-looking innovations turned out not to be . . . innovations. We “organics” got the last laugh, most recently, watching Mars Rovers continually getting stuck because, even on slightly rough terrain, wheels don’t work as well as feet. In terms of design, the bulky, weighty robots have been left behind because their very bulk and weight made it difficult for them to move freely and to perform flexibly enough to accomplish a wide variety of tasks. For most current robotic applications, biomimicry, imitation of real-life organic creatures, is the order of the day. And it makes sense. Every time we see a really creepy spider, we worry that one of those creepy things will find its way into our home. And they do — in spite of considerable obstacles. What better creature to imitate if your goal is to rescue someone in a collapsed building? Why try to figure out a new way to do what spiders have been able to do since . . . forever. Even better, this spider can be produced inexpensively using a 3D printer. The resulting Robo-Spider is disposable (just in case you don’t want these critters crawling around the house after they’ve done their job). Rather disturbingly, the Robo-Spider moves just like its biological counterpart and, if it has to, it can even jump — leaving me with vaguely disturbing mental image. Also, BAE Systems, a British defense company, is working on robotic spiders (and dragonflies and snakes) to aid soldiers in combat zones. These robo-spiders would play the role of scouts crawling through potentially dangerous areas and relaying precise reconnaissance information in situations too dangerous for human beings.